Beginning at daybreak, there had been seven hours of continual, unremitting bloodshed. At 1 PM, a large Federal force commanded by Ambrose Burnside finally managed to fight its way across Antietam Creek. This breakthrough occurred on the southernmost portion of the battlefield. 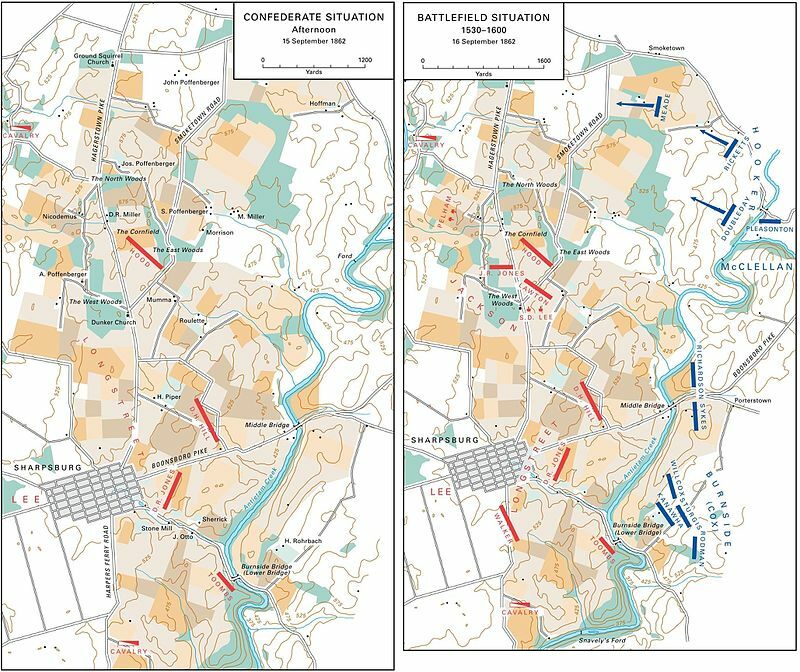 The Union was now poised to mount a final assault, possibly crush the Confederate army. But hold on, it wasn’t so simple. 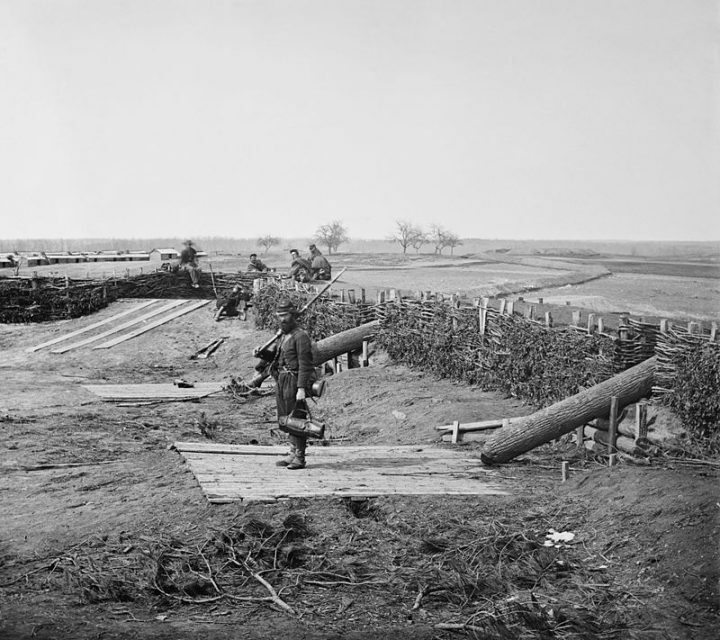 To launch that assault, dozens of regiments needed to be positioned along a massive, mile-wide line; caissons filled with ammo had to moved nearby; cannon had to be hauled to the choicest spots. 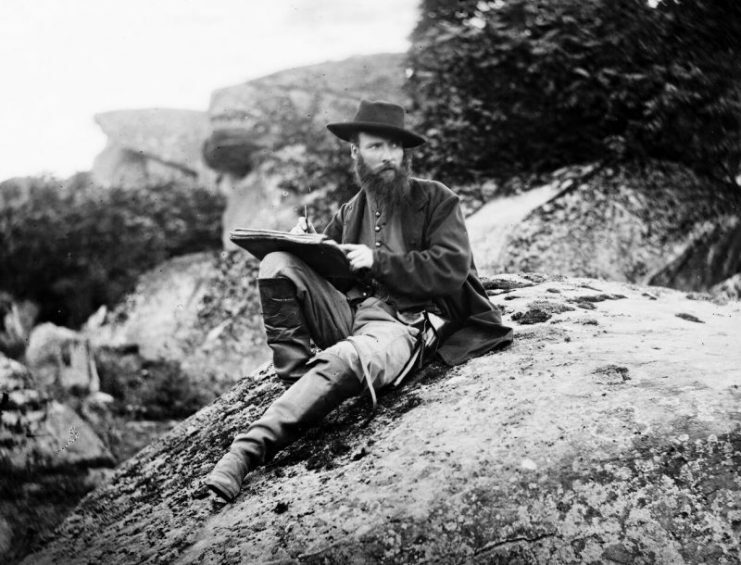 While this vast logistical undertaking was underway, nearly every other soldier elsewhere on the battlefield, both Yank and Reb, took a needed break. Certain places (The Cornfield, West Woods, and Bloody Lane), sites of the morning’s ferocious clashes, fell nearly still. Musket and cannon fire—which had maintained an unearthly din—dwindled to a few stray pops. It was almost as if the two sides had jointly agreed to a siesta. In truth, this break in the action was organic, spontaneous, borne of exhaustion. During the lull, soldiers seized the opportunity to eat a meal. It was lunchtime, after all. Bayonets—disturbing to use on a man, even one’s sworn enemy—proved ideal for skewering farmers’ chickens, and cooking them over open fires. Soldiers read newspapers and the Bible, or wrote letters home. They swapped stories, told jokes. Out came the little portable chess sets. 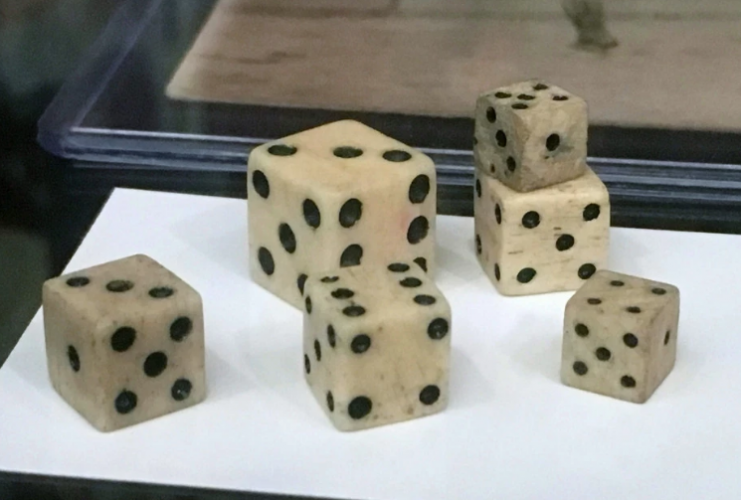 Some men had sewed checkered patterns onto their bedrolls, creating readymade chessboards. Many soldiers, Yank and Reb, made coffee. Others opted for a different mild stimulant, breaking out their tobacco. They smoked cigars and pipes, popped fat plugs in their mouths to chew or took pinches of “snouse,” which consisted of finely minced leaves cut with herbs. Sensing the quiet, a pig and her litter burst from the woods and went darting among the men of the 9th New Hampshire. The big sow ran between the legs of one soldier, lifting the shocked man off the ground and carrying him backwards a ways. His comrades roared with laughter. In other places, there was nothing but pain and grief. 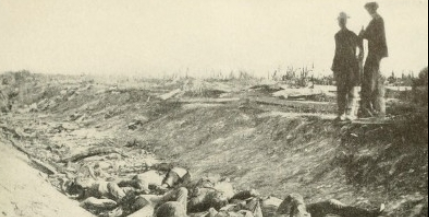 Wounded soldiers lay on the ground near dressing stations that were too overwhelmed by the morning’s mayhem to provide aid to everyone that needed it. Thousands of prisoners waited behind enemy lines, consumed with uncertainty. 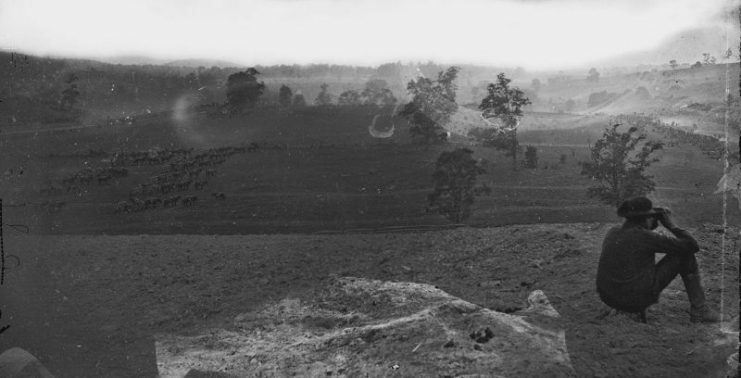 “Bloody Lane” in the sunken road after the Battle of Antietam, 1862. 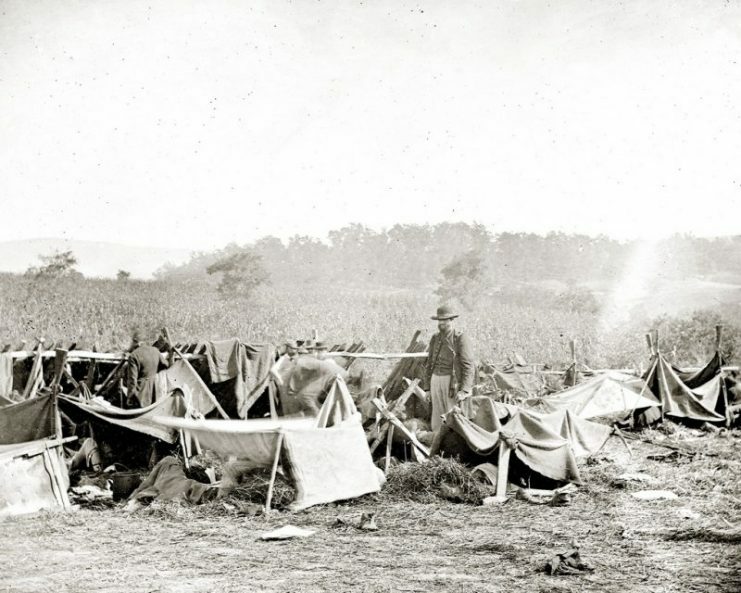 General D. H. Hill’s Confederate troops received multiple assaults and an enfilading fire from several Union divisions leaving this bloody scene. The two rival commanders were busy during the lull. The Union’s George McClellan took the opportunity to write a couple telegrams. One was addressed to Henry Halleck, general-in-chief of the Union army, back in Washington. 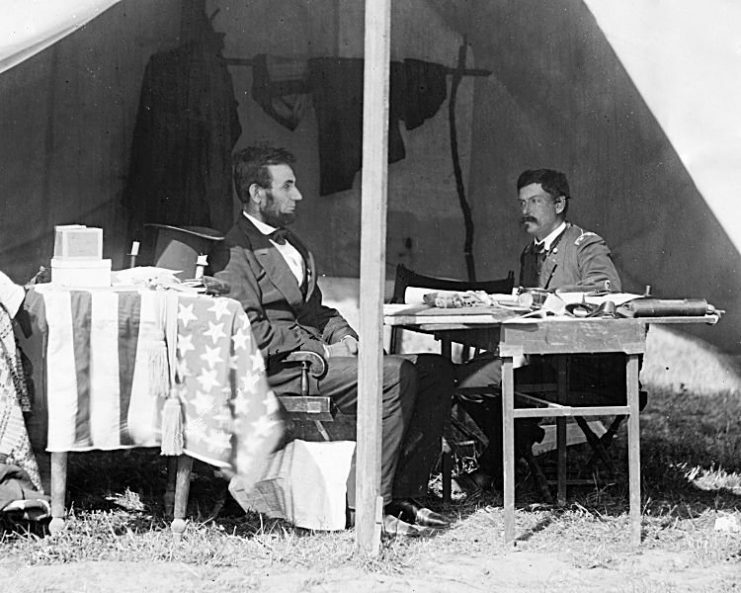 McClellan knew it would be routed to Lincoln. So he composed with care, writing but then striking through a line hinting that “great defeat” was possible. No doubt, he worried that this would raise the specter of possible failure. But then another line he tried seemed perhaps too presumptuous of success; he crossed it out, too. During the lull, for the first time all day, McClellan also visited the actual battlefield, making a suitably dramatic entrance. 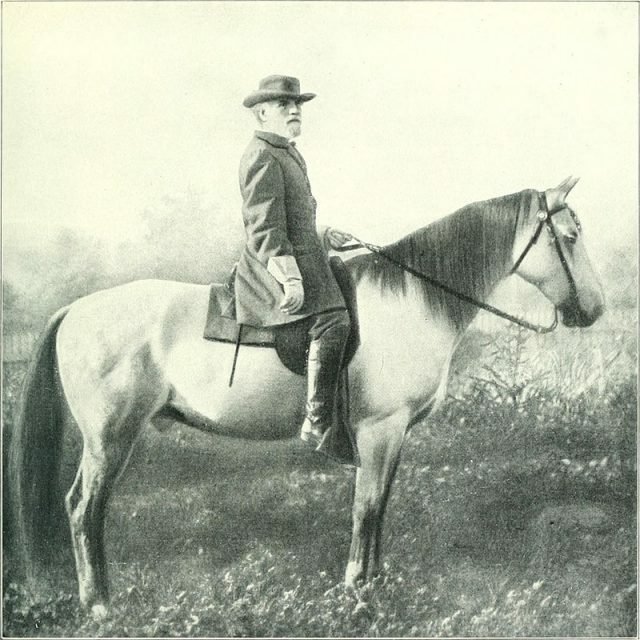 He arrived in the saddle of a large bay horse named Daniel Webster. 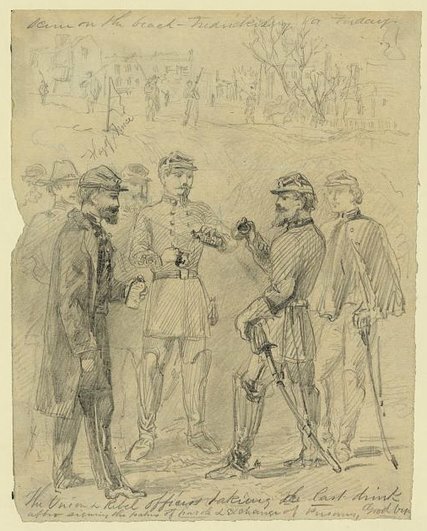 Near the Bloody Lane, McClellan conferred with two of his corps commanders, William Franklin and Edwin Sumner. 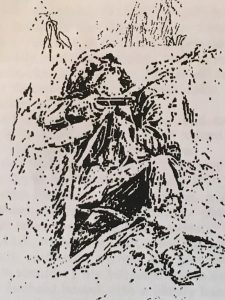 They discussed the wisdom of launching a second surprise attack on the Rebel center even as the Union final assault was being organized on the southernmost portion of the field. With the enemy in torpor, now was the time. But what if the sneak attack failed, simply resulting in a smaller force available for later in the battle when more men might be needed? What if Lee seized the opportunity to counterattack, striking some unexpected and vulnerable place along the Federal front? 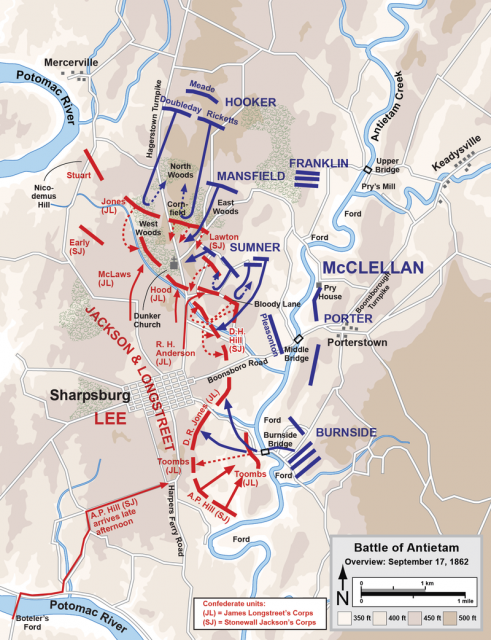 Ever-cautious McClellan decided to hold off, maintaining the focus on that planned final assault in the southernmost portion of the battlefield. While McClellan sputtered, Lee schemed. The Rebel commander was busily planning a counterattack, exactly as the Federals feared. What he had in mind was trademark bold: the Rebels would slip around the Union soldiers massed at the northernmost part of the field. That would make it possible to attack from a shocking and unexpected direction. The Rebels could strike from the rear. An order went out for available cannon to be consolidated for the effort. Among the Rebel batteries that answered the call was one now reduced to horses and ammo enough to operate a single gun. Lee was standing near his horse Traveller when this particularly decrepit battery dragged past. “General are you going to send us in again,” asked a young man, his face streaked black with powder. At first, Lee stared through the youngster. But then the briefest flash of recognition crossed his face. Why, it was his own child! 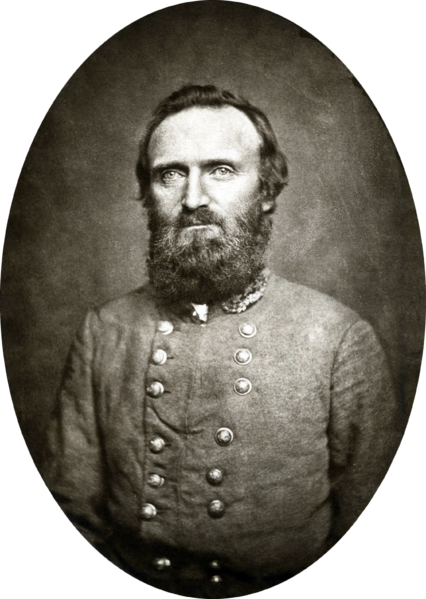 It was Robert Lee Jr.
At this same time, Stonewall Jackson was rounding up soldiers for the counterattack. But it was also vital to get an idea of the size of the Federal concentration on the northernmost part of the battlefield. So he ordered a North Carolina private to shimmy up a tall hickory to do some reconnaissance. Jackson asked the soldier for an estimate of how many bluecoats they faced. “Who-e-e! There are oceans of them, General,” replied the private. “Count their flags,” demanded Jackson. Jackson schemed during the break in the action. The private began to count out loud. When he reached 39, Jackson asked him to climb back down the hickory. Assuming two flags to a regiment, roughly a thousand soldiers per, the general’s natural estimate … well, they faced an ocean of Federals. Lee also put his sneak attack on hold for now. The New York Tribune, seeking an edge in the tough newspaper racket, had dispatched a team of four reporters. They spread out, covering different parts of the field. George Smalley, the team’s ace and a highly enterprising man, ranged broadly. Somehow he had managed to commandeer a horse as well as a Federal uniform, complete with sash and sword. “Who are you?” he was repeatedly asked. Also out in force were the “special artists.” This breed of journalist sketched the action in real-time, providing a unique window into warfare for the public. Among the established stars in the special-artist firmament were Alfred Waud of Harper’s Weekly and Frank Schell of Frank Leslie’s Illustrated Newspaper. Both were present, pads and pencils out, furiously sketching. During the break in the action, Schell visited Miller’s cornfield and surveyed the horrors. 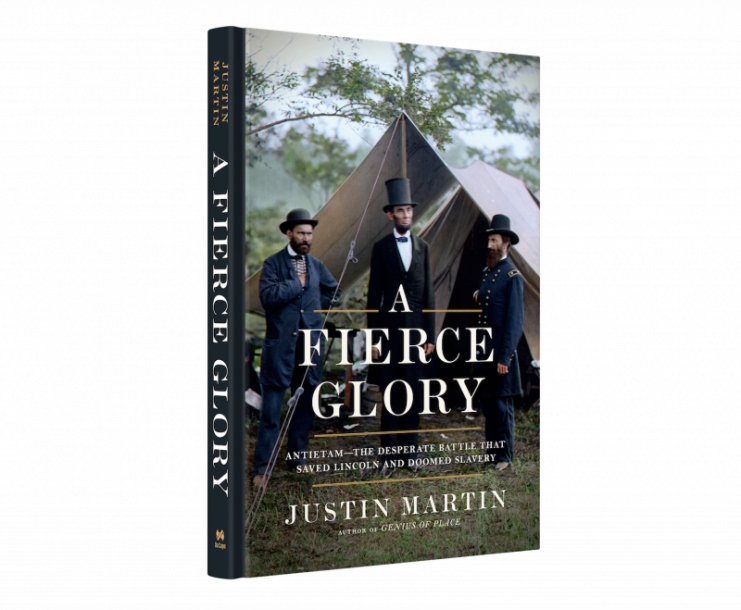 Walking among the broken stalks, he was alarmed to see a kneeling Confederate pointing a musket at him. Turns out, the Rebel was dead, frozen in “mute fidelity,” as the artist put it, to the final pose he’d struck upon this earth. 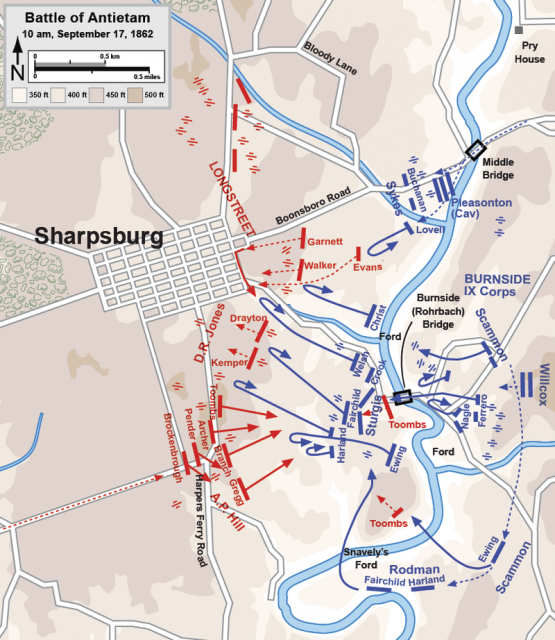 So to recap: here’s what the action consisted of over two midday hours during the battle of Antietam. Federal regiments were shuffled into place, preparing for a final assault. Elsewhere, soldiers read and relaxed, smoked and gambled. McClellan and Lee strategized. Journalists ranged about the field, reporting on the earlier carnage. And then, come 3PM—break over! That mile-long Federal line began to roll forward; the final assault was underway. 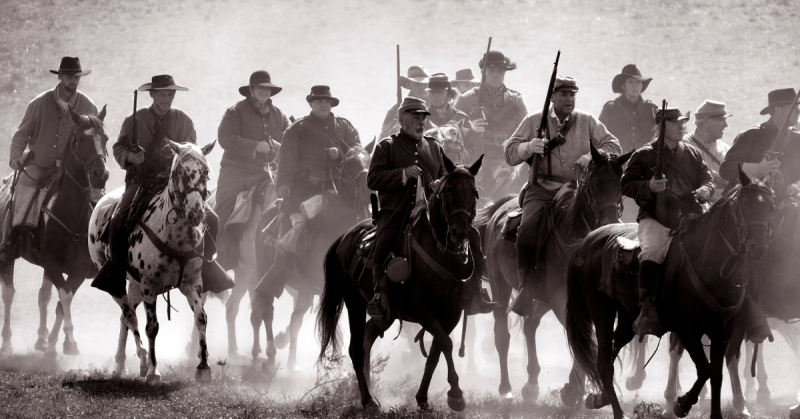 Soon the air was filled with the pop pop pop of muskets, the roar of cannon, the screams of men, and the whinnies of frightened horses, not to fall silent again until the terrible day ended.